This is so easy that there really is no excuse for you not to make it. Well, except maybe a fatal allergy to shellfish… You can also throw in a few mussels if you like them because when you’re talking about a big bowl of seafood… the more the merrier! Clams cooked in a white wine is classic and the fennel with garlic and onion make this dish amazing. Easy to make and rich in flavor. Rinse the shell fish well. In a large pot saute the garlic, onions and fennel over med heat until they begin to become transparent. Add the wine and bring to a boil. 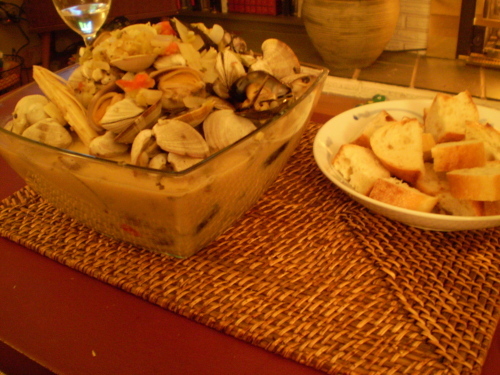 Add clams (and peppers or tomatoes if you’re using them) stirring occasionally until clams start to open (about 5-7 minutes) Discard any unopened clams, sprinkle with salt & pepper and serve in broth with fresh bread.